Fri Sketcher this week is a brilliant sketch from bea I had just finished colouring 1 of the new Sarah Kay stamps I got from Glitterpot (just wish I hadn't pre-ordered the bulk of them from US back in April when I didn't know when the UK would be getting any as I am having to be patient now, knowing I could have had them sooner but hindsight is a great thing!) so this card came together really quickly for me. Others: Only flourish die I have is a long quickcutz 12" border 1 which I just cut bits from and coloured with chalk inks to match papers. Flowers and brads from stash. I received this fab award last night and this morning from Carole, Sonia and Annie! What a fab way to end the weekend and to start a new week. It's given to weblogs that catch your eye so I'm so chuffed you all thought of me, thank you! The rules are to pass it on to 7 people and then let them know, link who nominated you, etc .. (usual rules which I won't bother repeating). A mixture of some 'old favourites' plus a few more recent new finds - you are all truely inspirational but bad for my bank account LOL! Sorry if you've already had this award but it's your own fault for having such fab blogs ! Edit 2: Ooo, just got this off Maria too! Thank you soo much!!! Ooo, also look what landed on my door just now - the Magnolia summer club Whoooooohooo!!!!! Ismaki, High Hopes and more colouring in. Just can't stop colouring in with my markers at the moment, novelty hasn't worn off yet! Coloured in 2 high hopes cuties yesterday and was supposed to make 2 challenge cards with them but was too late for the 'stamp something' challenge but made them both up anyway. Colouring medium: Letraset promarkers and white gel pen for highlights. Actually didn't use any stickles, don't know what's wrong with me?! 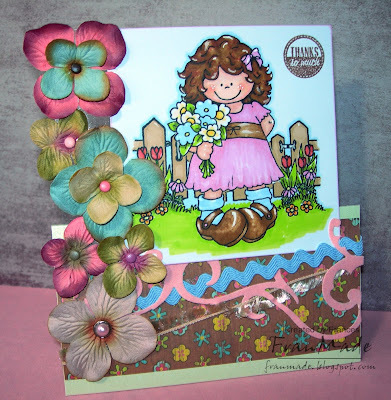 Others: 1st card- prima flowers, brads and sentiment stamp from stash. flowers are actually attached to a bit of acetate. 2nd card- flourish quickcutz die cut on pink velvet paper. again flowers, brads from stash. That's my lot now until Monday probably. Have a fab weekend. For a minute there thought I'd lost my internet connection (seem to have a temperamental modem) so best post this in case it goes again. This is for the second Penny black challenge which is 'friendship' and the layout was loosely based on PTW sketch by Katharina with emphasis on the word 'loosely' as I didn't think the scallop edge suited this card, it's not a square card and the sketch was more elegant and less cute (but I just can't seem to make a card without adding a stamped image)! I love this stamp, it's so funny, also got the one of them in a row knitting. 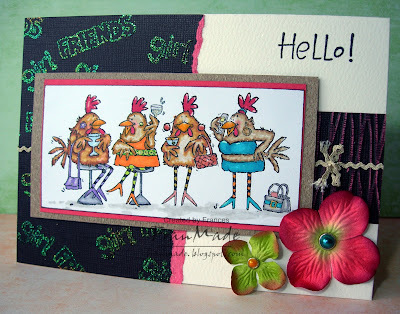 Images:'chicky night' PB stamp. 'girl friends' and 'hello' studio G 99p clear stamp sets. girlfriends randomly stamped with versamark then heat embossed with holographic powder. Paper: Coredination's Black Magic cardstock (black on 1 side, colour below it and on the back so great for sanding, embossing). strip on the right has been embossed with folder then sanded down to reveal the red underneath. Strip on the left has just been torn down one edge to reveal the red and have also used the red side another piece to mat the image. The brown piece was some paper I found in papermill a while ago which has this great wooden finish and feel to it - might see it better if you click on photo. 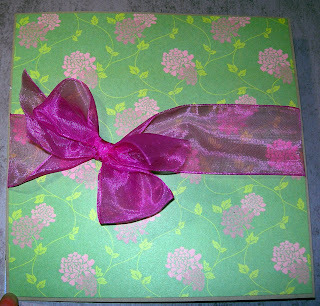 Others: ric rac ribbon, prima flowers & pearl brads from stash. Central image is actually raised on 3d foam pads but can't tell from photo. Spoonful of Sassy & checks! I'm really happy with this and am loving using them at the moment so you may find me neglecting my prismas/distress inks for a little while :) Love the skin colours in the pens. I use combination of ivory, blush and dusky pink then just a hint of pastel pink for the cheek. Should be enough 'checks' as the yellow piece is check and the lilac embossed piece is 'argyle' checks (cuttlebug folder). Also used my border folder for the row of buttons (love this folder). I swiped both folders with versamark ink before embossing then dusted the embossed pieces with some PearlEx powder (Annie reminded me I had some of the stuff in my cupboards which I hardly ever use). 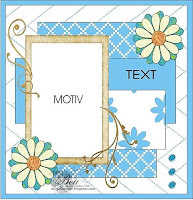 Then just added a little sentiment, charm and flower from stash. Have a good day, I was going to mow the lawn today but the weather's not co-operating will just have to makes some more cards instead, what a shame! Oh, in case any of you were waiting, Glitterpot have got the Sarah Kay clear stamps in stock, so hurry on over before they sell out (and don't blame me if you overspend)! 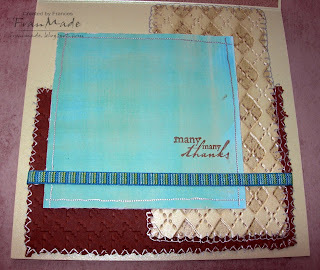 Theme this week on CCT is 'no patterned paper'. So time to get creative and make your own backgrounds, use embossing folder, anything as long as there's no shop bought patterned paper. So out came my new embossing folders and bits of card. What started out in my head as a simple tent fold card with 1 image turned into a more elaborate kickstand card (with acetate) using a different image (thanks Nikki, she is a cutie :) ). Had no plan, it just kind of evolved into this once I started playing with all the layers and bits I wanted to include. The first photo is taken flat so you can see the whole design as the bottom half is acetate. Images: papilio stamp that I don't yet own! 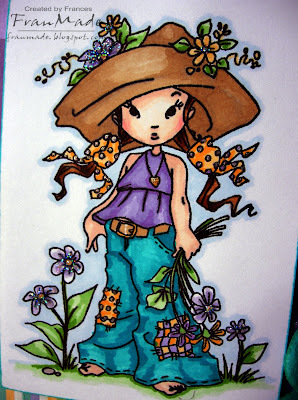 Image from swap I did with Nikki, isn't she cute?! 'many thanks sentiment' from hero arts set. Colouring medium: promarkers for the image. 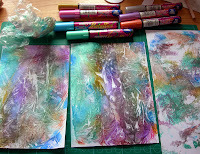 distress inks for edges and for some of the embossing folders. Silver gel pen for all the faux stitching - looks like glittery metallic thread IRL. 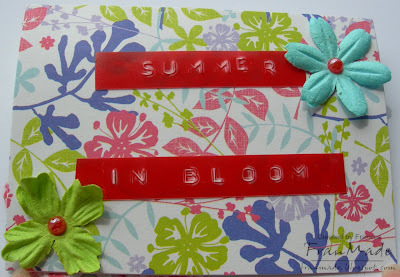 Others: front of the card was done with the new embossing border strips. I used 3 of the ones in the 'just my type' set. Just swiped them with distress inks before I ran it through my cuttlebug. Really liked how the buttons turned out - will be doing that again! Inside the card are 'argyle' and 'houndstooth' folders. Again argyle was swiped with ink before embossing. The blue piece is background paper I made and had leftover from previous challenge to use alcohol inks. All edges cut with decorative scissors or distressed using my heidi swapp distresser. Ribbon,flowers, spacer and brad from stash. Hope you'll join in this week, and there's more candy to be won, pop on over to CCT for details. 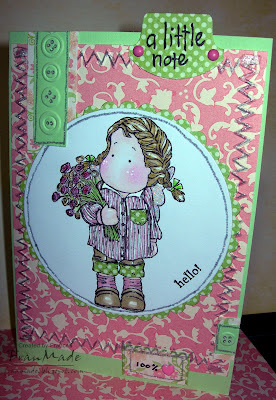 I'll be back later to show you another card finished yesterday. Hope you'll join in the fun this week. Have a blooming nice day! 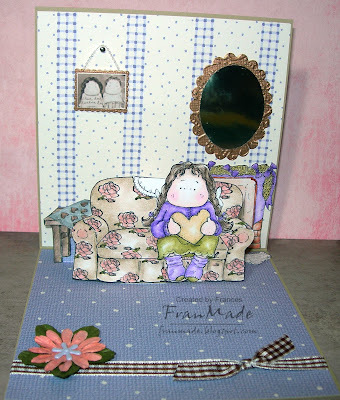 Dotty Tilda - "In my thoughts"
Images: all magnolia stamps from the latest 'summer & sea' collection. 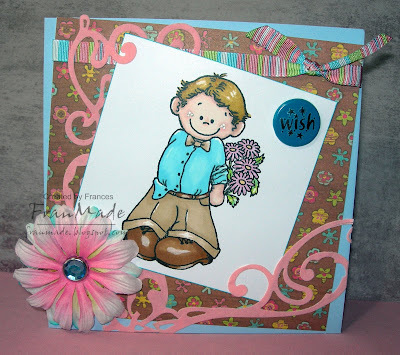 The sentiment is from a little studio G clear set All coloured with Letraset Promarkers. stickles on wings and water plus clear glaze pen on water as well. Papers: from DCWV baby boy nursery stack. 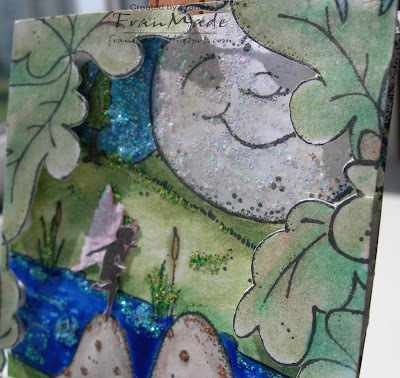 The scalloped spotty green frame is scrap from a previous card - glad I didn't chuck it now! Hope everyone had a good weekend, I didn't make any cards at the weekend as wasn't in the mood but made this today as I was trying out some new marker pens. Images: Hanglar image from blog buddy ;) I've been saving for months but as I will be getting this baby along with a few others in rubber form soon decided it was safe for me to use now! Coloured with letraset promarkers. 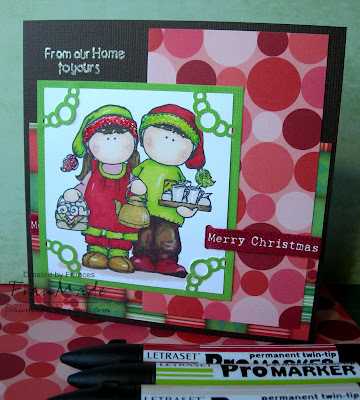 ** sentiment from a woodware xmas clear set 'home for christmas'. Others: EK success corner adorner punch 'bubbles' and ribbon from stash. So, anyway, before I bought all the colours I wanted from Silly Monkeys (only place I could find which had such a big choice at a good price) thought I'd best try some out first to make sure I'm happy with them, so popped to my local art store today and got a few to try and this is my first card made with them. It is also why it's a christmas card as the limited colours I had dictated the colour scheme of the card! Still need practice using them but that's half the fun but happy enough for me to have ordered the rest I wanted. Just need to wait for them to come now, can't wait! Need to go and do my DT cards now. Not having made anything over the weekend has really put me behind! 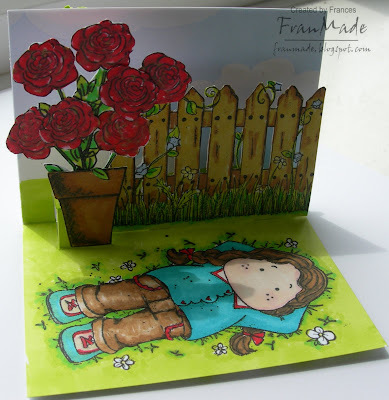 Ismaki sketch this week is to create a pop up card using this layout. 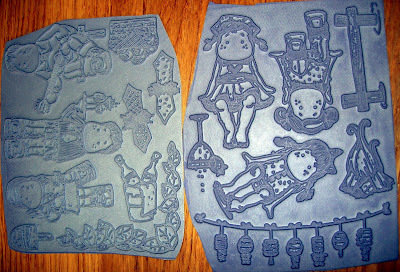 Well, I received some fab stamps from Alota rubber stamps (fab service, arrived 6 days from US) and the 1 I was itching to use was this sofa/couch stamp. So set about creating scene round that. This is close up from the right so you can see the fireplace, sheepskin rug and mirror better! Not going to list everything (would take too long) but all stamps except the couch were Magnolia with some adaptation (eg. cookie tray from tilda with cookies, table is chair with the back cut off, rug is top bit of another seat)! Apart from that only other tools used were my nesties for the mirror and photo frame. For those eagle eyed amongst you, after taking couple of photos decided that I wanted Tilda to be human so ended up cutting off her wings which you can see is missing in one of the shots. Any questions, just ask! 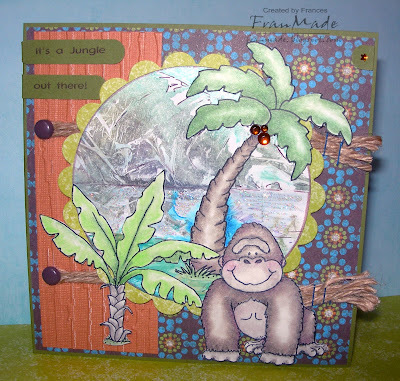 This is only my second pop up card and had such fun, will definately be doing more in future. Another nice general theme this week on CCT which is "Birthdays". Looking through my PBs the other day I found these guys which I haven't got round to using (purchased about year ago I think!) and thought they'd make a fun birthday card. Layout just came about from using up the scraps I had left from a previous card (Basic Grey pad I think) and it's a kickstand card as the green base card wasn't quite wide enough to make a normal DL size card. 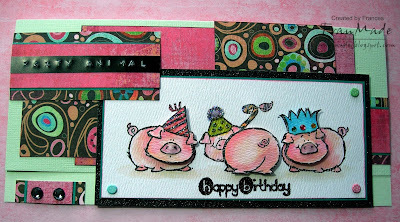 Stamp: 'party animals' Penny black. 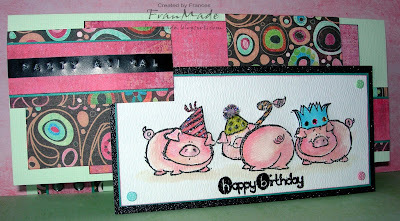 'Happy Birthday' is studio G 99p clear set, embossed with holographic black powder. Papers: scraps from scrap box (Basic Grey pheobe I think?) 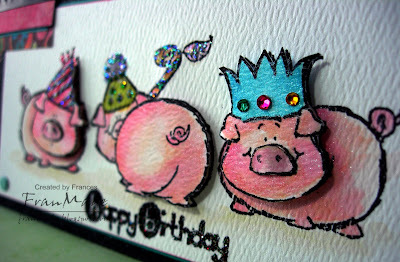 and black glitter cardstock for the mat round the piggies. Thank you for all your well wishes yesterday. Am feeling better now (think it was just the old monthly hormones, in my case it wrecks havoc with my digestive system and always get unsettled tummy along with headaches and general 'blearh-ness') but the horrid weather isn't helping now - you can always tell when it's Wimbledon fortnight - bound to rain isn't it?! Have a nice day, hope it's a good one. 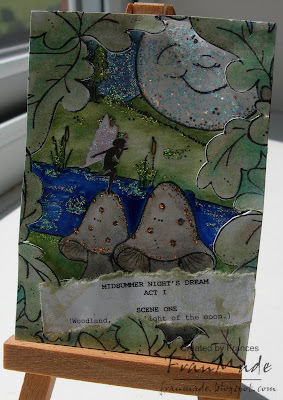 This week's ATC theme over on Tilda & Friends ATC has been set by guest DT Jacqui who has chosen 'Midsummer night's dream'. It doesn't have to be about Shakespeare's play, anything to do with a midsummer night or evening will be fine. Well, this was a tough one and the only thing that kept coming to mind for me was that it's a play and it's set in woodlands with fairies (afraid that's all I can remember from my English lit lessons all those years ago)!!! Get your thinking caps on, as there's candy draw this week for a stamp (chair). 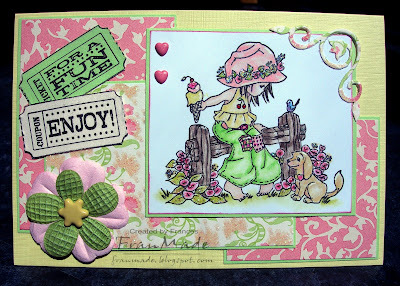 See the blog for details and more inspiring ATCs from the other DT members. Been trying to do the 'serendipty' challenge on tilda & co but it just ain't happening and have already binned 2 attempts. Have also realised I sometimes get dictated too much by the challenges and end up not using the stamps that I want to use. That plus I don't seem to be in the mood this week (not feeling 100% but hopefully that will pass) so have just played with some of my new stash without trying to fit it into anything. 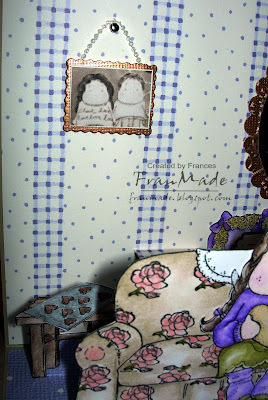 Used my new 'crowfoot Tilda' (just love her hair and her shirt), some of the new cuttlebug folders (the buttons and zigzag embossing are from the border folders called 'just my type') and those leftover papers again (still not finished them but am bored of them now so they will be going in the scrap box). Hope you like it. 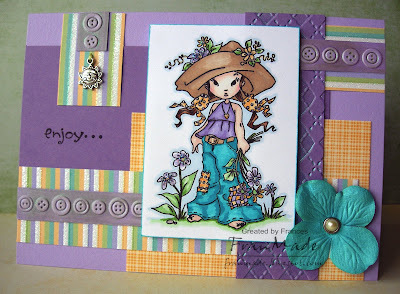 I've got my DT tilda & friends ATC to show tomorrow and hopefully my mojo will return soon. Think I need a break in front of the TV with a good DVD - off for a rummage through my chick flick stash (almost as big as my stamp collection LOL). 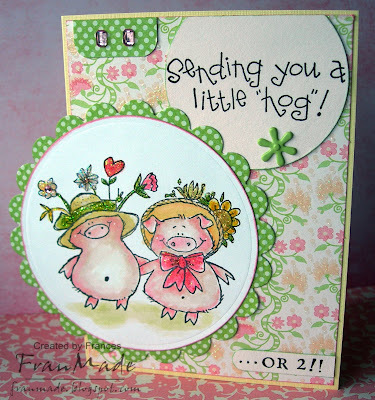 There's a fab new challenge blog especially for Penny Black stamps which just started Sat which is brilliant as I do love my PB's - they are my first love and were the only 'cute' stamps I had before I discovered Magnolias, High Hopes et al. Penny Black Saturday's first challenge is to use the very first PB you bought. Well, I had to have a good think about that as it was a while ago! Finally remembered it was this one. Well, actually got more than 1 at the time (as if I'd ever just get the 1 stamp!) but I thought this one worked best with the papers I wanted to use up. Images: 'Pinky & Porky' & 'sending you a little hog' PB stamps. coloured with distress inks and stickles. Paper: DCWV Baby girl Nursery stack - are you sick of it yet?!! It's just that if I don't use up the bits now they will just end up in my scrap box & I'll forget about them! Think you'll have to put up with it for 1 more card! Others: Circles nestabilites die used. the 'or 2' is stamped out using a very old hero arts alpha set and then punched out with my SU word window punch. flower Brad and gems from stash. Had great fun with this, can't wait for the next one! Think my PBs will get a better share of my attention now! One more card to show today then I'm off to work and probably won't have another card to show until Sun/Mon. Also some of the new Magnolia stamps landed on my door today so am a happy bunny - only took 6 days to get here from ordering. Just need to wrestle with the EZ later! Have a good weekend if I don't catch you before then! 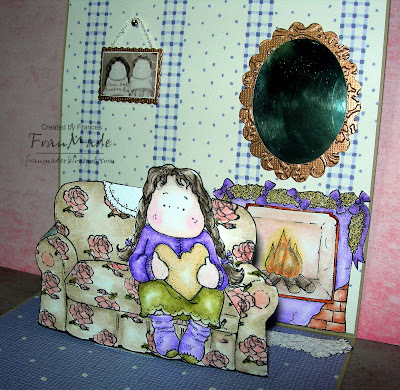 Another fab sketch from Katharina this week on PTW and the optional extra of using chipboard. 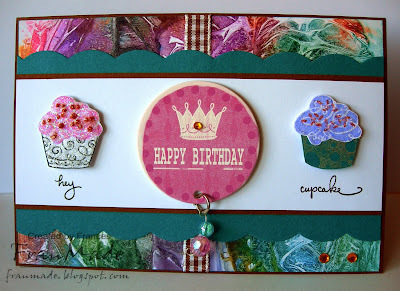 The cupcakes and sentiments are a Stampendous Perfectly clear set 'hey there cupcake'. Just stamped and cut out and added lots of stickles and stuck on with 3d foam. 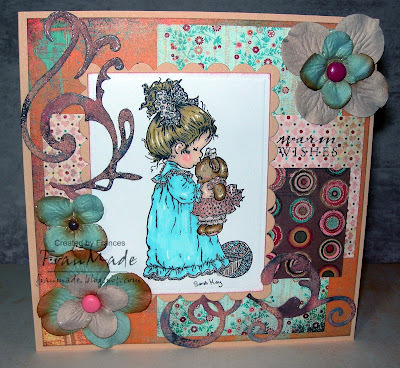 circle 'happy birthday' chipboard embelli and everything else from stash. AND also 'Stamp something' this week is 'in the wild'. Paper/card: patterned paper from my scrap box, orange strip embossed with cuttlebug folder to give wooden texture/feel to it. Others: circle nestabilites used. gems, brads and garden twine from stash. Sentiment printed off pc and cut out using SU word window punch. Spoonful of Ismaki Workout: "Adore"
Aren't blogging buddies the best? CCT 13: Christmas time . .